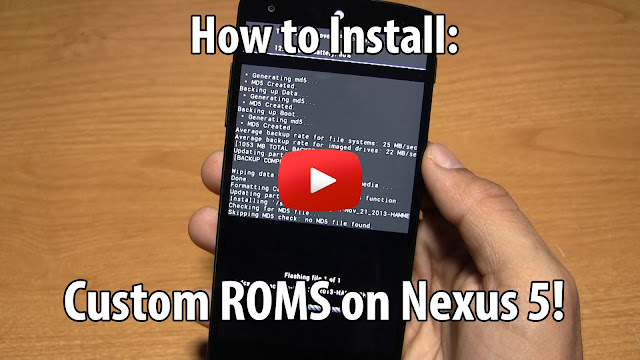 How to Install Custom ROMS on Nexus 5! ~ AndroidRootz.com | Source for Android Rooting, ROMS, Tricks and More! How to Install Custom ROMS on Nexus 5! Note: You must have ClockworkMod Recovery or TWRP installed on your Nexus 5, if you don't follow this rooting guide. Getting your device rooted and having the ability to install custom ROMS to your Nexus 5 gives you a huge amount of freedom to what you can do to your phone! Installing custom ROMS allows you to be on the latest Android version much faster than waiting for an OTA update also there are tons of mods you can add to your phone! Mods that make your phone faster, improve battery life, and even give you a better software experience. Some of these mods are so good that Google sometimes put similar mods into official Android versions! Also with installing custom ROMS you get to experience some of most popular available ROMS like Paranoid Android, CyanogenMod, and AOKP! Follow the guide below to install custom ROMS on a Nexus 5! Note: All data will be wiped, make sure you backup anything important!